This key is used to register any particular user as a developer. This key is only required to be entered once. The Object key allows the changes in SAP dictionary objects or SAP sources. An object should be only registered when it is changed by a registered developer for the first time. The key will be no longer requested if the object is changed at anytime time later. Please keep in mind that if you modify several programs then you will require individual object keys each of them. 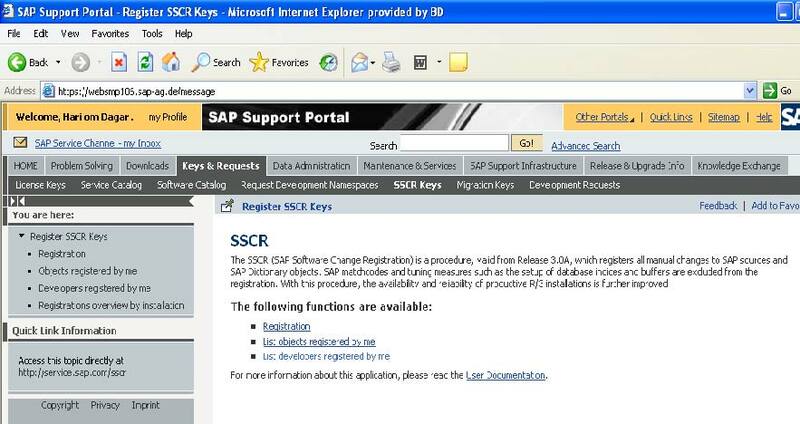 Both Developer key and Object key be requested through SSCR (SAP Software Change Request) Key application. Note: In order to use SSCR Key application, the user must have Register Object and Developer Keys (or at least Register Object Keys) authorization. In order to request it contact user administrator of the company. Open SAP Marketplace, login with OSS id and password. Click on Key & Requests Tag, go to SSCR Keys Tab and click Register Developer. Fill and check the Basis release, PgmID and Object name. Check the installation ID needed. Then Click Register & the Object access key will generate at the bottom of the page. It will give u registration key.